Eat Me Supplements range of high quality protein shakes and healthy nutrition is so popular that we feel like we know a thing or two about what makes a great smoothie. That’s why we’re excited to announce our ground breaking new range … Multi-Flavour™ Breakfast Smoothies. Convenient and portable, smoothies are ideal for an-on-the-go breakfast, afternoon snack or dessert. But old school protein shake flavours like vanilla, strawberry and chocolate are just too predictable. Until now! Using molecular freeze dry flavouring technology pioneered for deep space travel and UN food aid, and by harnessing time release particles; we captured multiple flavours and infused all of them into New Zealand’s best protein powder. With our proprietary Multi- Flavour™ technology, your smoothie begins with one delightful aroma and flavour, and then softly and slowly changes to a new flavour. It’s amazing! Our discovery packs the flavours of a complete four course meal into one perfect drink. 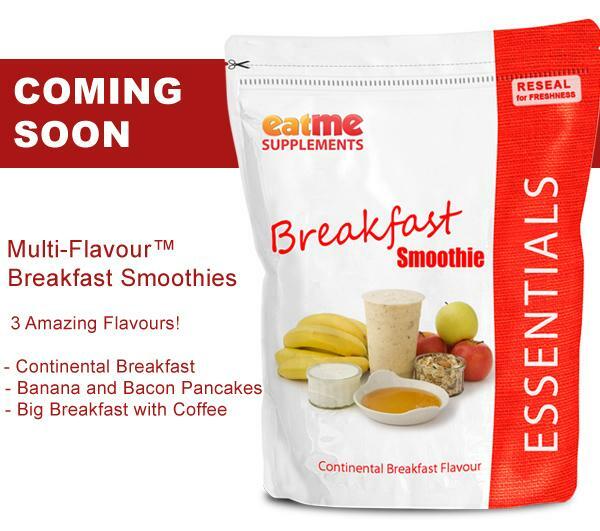 Eat Me Supplements have created a sizzling selection of traditional Kiwi breakfast flavours all in a smoothie. Simply add milk or water to your Eat Me Supplements shaker bottle, add two spoons of Breakfast Smoothie powder, apply the lid, shake well and enjoy! Light on the pallet, this smoothie begins with the flavoursome tones of natural muesli with manuka honey, followed by yogurt and oven baked buttery and flaky croissant, and finishes with the delightful aftertaste of freshly squeezed orange juice. You’ll be hungry for more! Think 3 perfect oat pancakes topped with beautifully caramelised bananas and lashings of syrup. The key to fine tuning this textured flavour was to sift the cinnamon and flour together before adding them to lightly whisked eggs. Prepared by our mystery Master Chef, every molecule of this classic meal was snap frozen and instantly powdered to create our ultimate smoothie! Prepare for a harmonious balance of bacon that hasn't been fried to an inch of its life (and definitely more than just two miserable rashers), eggs, slow roasted tomatoes, chipolata sausages, local field mushrooms, hash brown, and thick white toast with New Zealand butter; all complemented by lingering notes of freshly brewed strong black coffee. Like any good big brekkie, our Big Breakfast comes with your choice of eggs. Shake well to mix your Smoothie, then give one extra shake for eggs 'Sunny side up', another shake for eggs 'Over hard' and one more shake for ‘scrambled’. That’s our patent pending Double Shake technology at work. You’ll see more of that in our upcoming range of Indian Curry Smoothies™ with one extra shake for mild, two shakes for medium and three shakes for hot! Like our Facebook page and subscribe to our mailing list for Multi-Flavour™ Breakfast Smoothies and Indian Curry Smoothies™ launch updates, hot deals, recipes and specials.